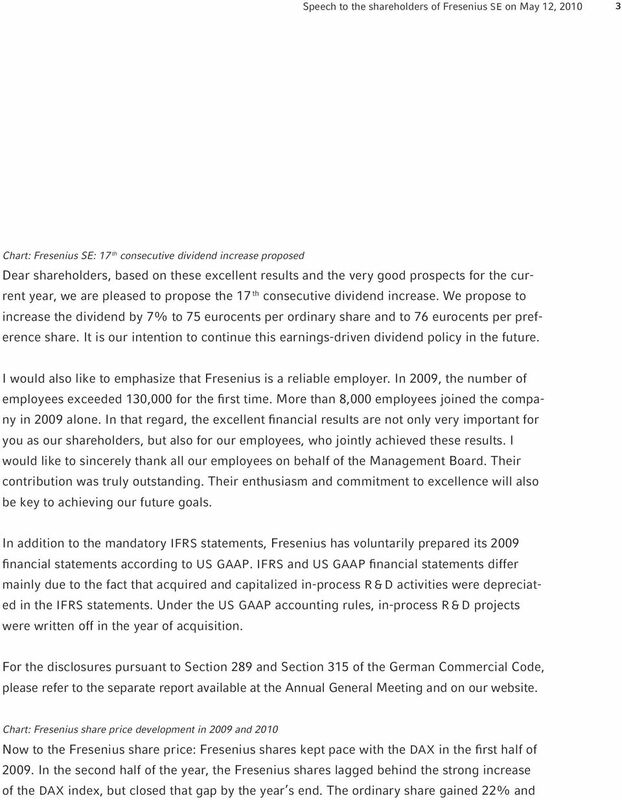 Download "Annual General Meeting of Fresenius SE on May 12, 2010. 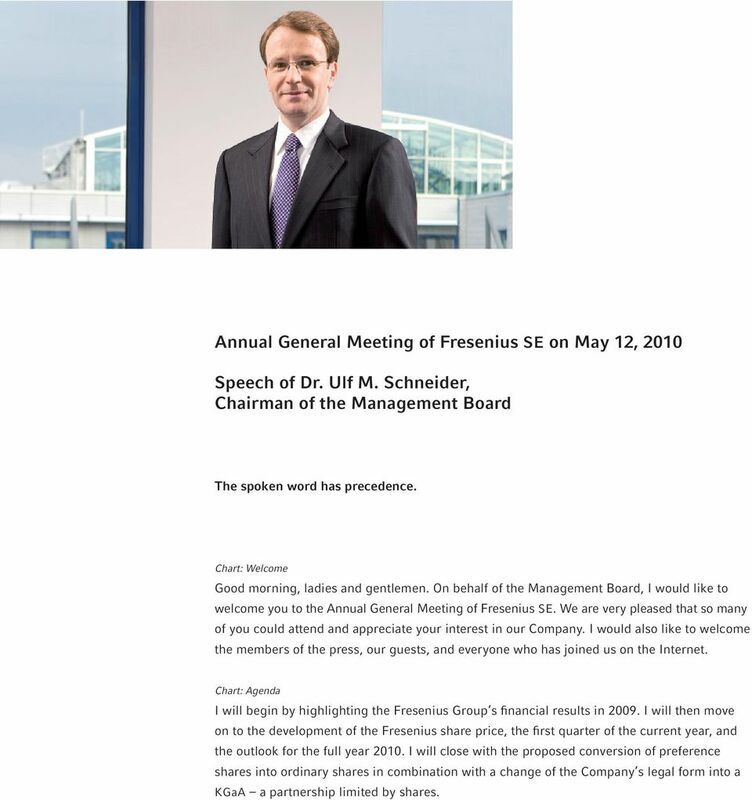 Speech of Dr. Ulf M. Schneider, Chairman of the Management Board"
1 Annual General Meeting of Fresenius SE on May 12, 2010 Speech of Dr. Ulf M. Schneider, Chairman of the Management Board The spoken word has precedence. Chart: Welcome Good morning, ladies and gentlemen. On behalf of the Management Board, I would like to welcome you to the Annual General Meeting of Fresenius SE. We are very pleased that so many of you could attend and appreciate your interest in our Company. I would also like to welcome the members of the press, our guests, and everyone who has joined us on the Internet. 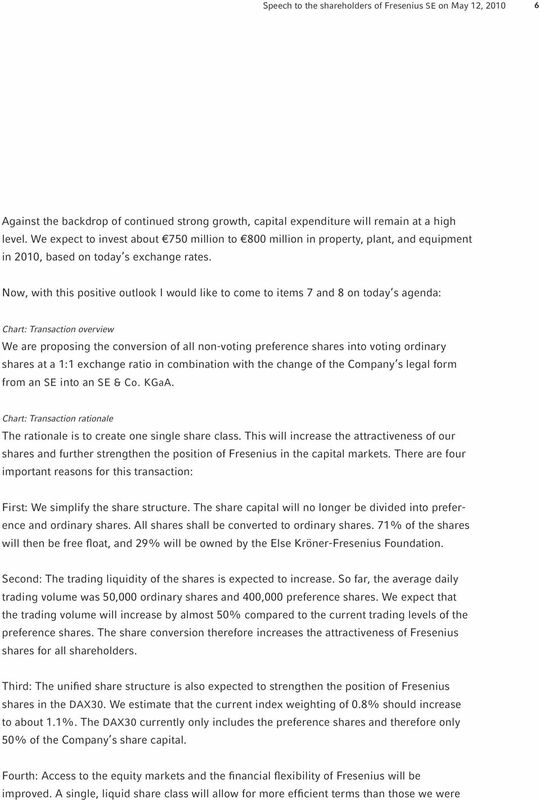 Chart: Agenda I will begin by highlighting the Fresenius Group s financial results in I will then move on to the development of the Fresenius share price, the first quarter of the current year, and the outlook for the full year I will close with the proposed conversion of preference shares into ordinary shares in combination with a change of the Company s legal form into a KGaA a partnership limited by shares. 2 2 Chart: 2009 A very successful year for Fresenius Fresenius achieved record sales and earnings in 2009 despite a challenging macroeconomic environment. All business segments and regions contributed to these financial results. We had an excellent cash flow and were able to significantly improve our debt ratios after the acquisition of the generics company APP Pharmaceuticals in the United States. The net debt / EBITDA ratio was 3.0 at the end of 2009, so we reached our 2010 target range of 2.5 to 3.0 one year ahead of time. 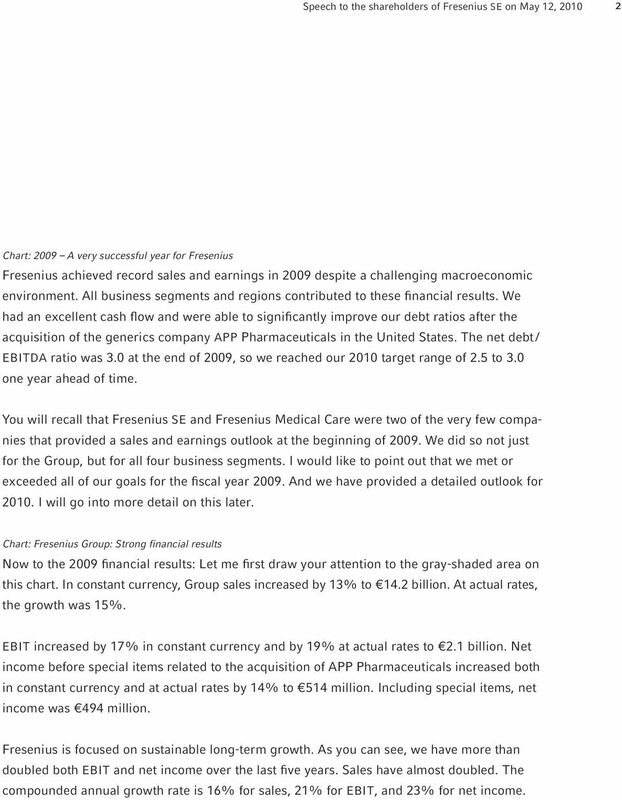 You will recall that Fresenius SE and Fresenius Medical Care were two of the very few companies that provided a sales and earnings outlook at the beginning of We did so not just for the Group, but for all four business segments. I would like to point out that we met or exceeded all of our goals for the fiscal year And we have provided a detailed outlook for I will go into more detail on this later. Chart: Fresenius Group: Strong financial results Now to the 2009 financial results: Let me first draw your attention to the gray-shaded area on this chart. In constant currency, Group sales increased by 13% to 14.2 billion. At actual rates, the growth was 15%. EBIT increased by 17% in constant currency and by 19% at actual rates to 2.1 billion. Net income before special items related to the acquisition of APP Pharmaceuticals increased both in constant currency and at actual rates by 14% to 514 million. Including special items, net income was 494 million. Fresenius is focused on sustainable long-term growth. As you can see, we have more than doubled both EBIT and net income over the last five years. Sales have almost doubled. The compounded annual growth rate is 16% for sales, 21% for EBIT, and 23% for net income. 4 4 the preference share 20% in Both share classes therefore roughly matched the development of the DAX, which was up 24% in Fresenius shares have significantly outperformed the DAX in the first few months of this year. The ordinary share is currently 14% and the preference share is 1% above 2009 year-end levels. The DAX lost 4% over the same period. We consider the significantly stronger increase of the ordinary share in comparison to the preference share as a positive signal from the capital markets toward the creation of a single share class. I will come to that later. I am convinced that Fresenius shares will continue to be an attractive investment in the future. This is supported by our good financial outlook and the successful continuation of our growth initiatives. The vast majority of analysts continue to rate Fresenius shares as a buy. Chart: Fresenius Group: Successful start into 2010 I will now discuss the first quarter of We had a very successful start, and the results are fully in line with our outlook for the year. Group sales rose to 3.6 billion, an increase of 10% in constant currency and 8% at actual rates. Net income before special items was 119 million. This is an increase of 8% in constant currency and at actual rates. All business segments are on track and well-positioned to achieve their targets for Chart: Fresenius Medical Care: 1st quarter 2010 and outlook Fresenius Medical Care achieved sales growth of 13% to US$2.9 billion in the first quarter of Net income increased by 7% to US$211 million. The Company fully confirmed its outlook and expects to achieve revenue of more than US$12 billion in Net income is expected to be between US$950 million and 980 million. 5 5 Chart: Fresenius Kabi: 1st quarter 2010 and outlook Fresenius Kabi had a successful start into Sales increased by 11% to 800 million. EBIT rose by 5% to 145 million. 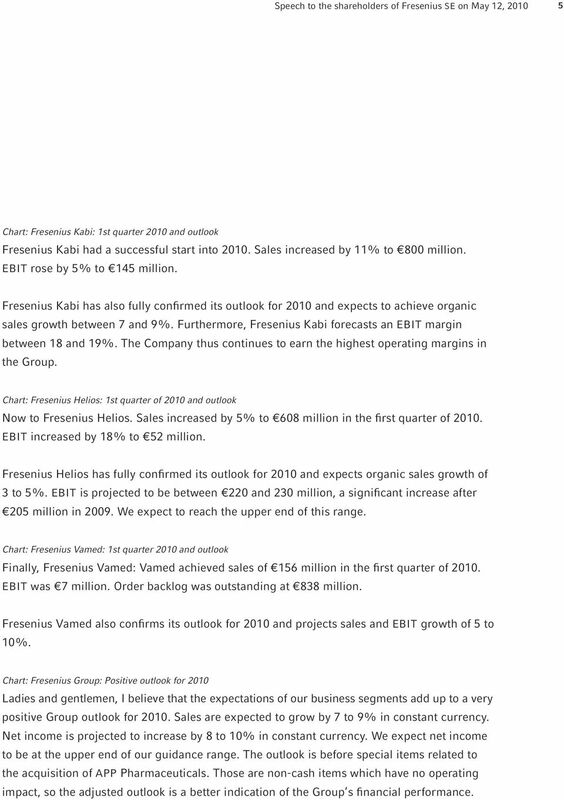 Fresenius Kabi has also fully confirmed its outlook for 2010 and expects to achieve organic sales growth between 7 and 9%. Furthermore, Fresenius Kabi forecasts an EBIT margin between 18 and 19%. The Company thus continues to earn the highest operating margins in the Group. Chart: Fresenius Helios: 1st quarter of 2010 and outlook Now to Fresenius Helios. Sales increased by 5% to 608 million in the first quarter of EBIT increased by 18% to 52 million. Fresenius Helios has fully confirmed its outlook for 2010 and expects organic sales growth of 3 to 5%. EBIT is projected to be between 220 and 230 million, a significant increase after 205 million in We expect to reach the upper end of this range. Chart: Fresenius Vamed: 1st quarter 2010 and outlook Finally, Fresenius Vamed: Vamed achieved sales of 156 million in the first quarter of EBIT was 7 million. Order backlog was outstanding at 838 million. 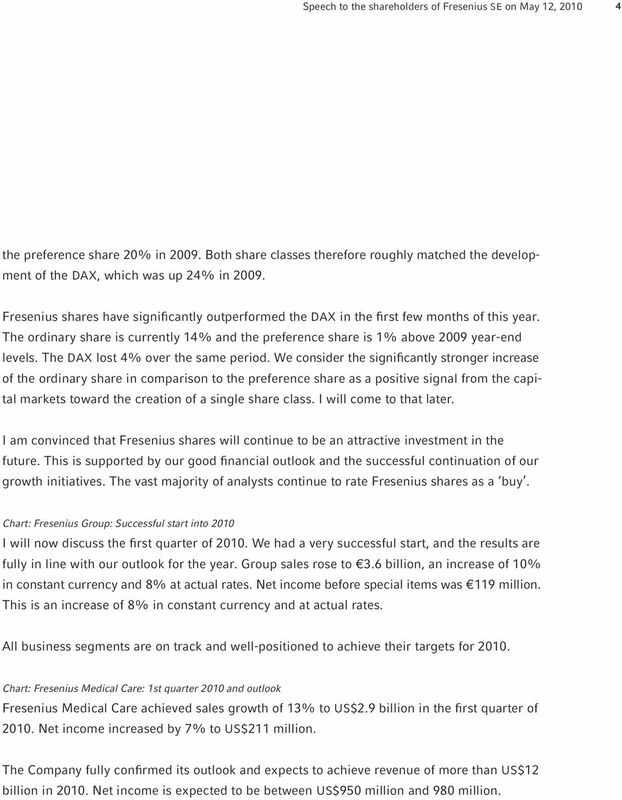 Fresenius Vamed also confirms its outlook for 2010 and projects sales and EBIT growth of 5 to 10%. Chart: Fresenius Group: Positive outlook for 2010 Ladies and gentlemen, I believe that the expectations of our business segments add up to a very positive Group outlook for Sales are expected to grow by 7 to 9% in constant currency. Net income is projected to increase by 8 to 10% in constant currency. We expect net income to be at the upper end of our guidance range. The outlook is before special items related to the acquisition of APP Pharmaceuticals. Those are non-cash items which have no operating impact, so the adjusted outlook is a better indication of the Group s financial performance. 8 8 standing shareholders. In addition, the foundation is subject to a voting restriction for certain resolutions such as the election of the Supervisory Board of the KGaA and the appointment of the auditor. In that respect, the outstanding-share holders retain the sole voting right. Certain resolutions of the Annual General Meeting, in turn, require the approval of the general partner. This especially applies to changes in the Articles of Association. We will retain our proven governance structure in the KGaA with a Supervisory Board consisting of 12 members, including international labor representatives. We will continue to maintain our high standards of corporate governance and transparency within the new structure. The Else Kröner-Fresenius Foundation has informed us that it endorses the resolution and will hold on to its shareholding in Fresenius for the long term. The foundation has been a reliable shareholder with a long-term interest in the development of Fresenius, contributing to a stable shareholder structure. Chart: Change of legal form into a KGaA The business strategy of the Company will not change with the conversion into a KGaA.. The Group s organizational structure will not change either. Fresenius SE & Co. KGaA will continue to act as the operating holding for Fresenius Medical Care, Fresenius Kabi, Fresenius Helios and Fresenius Vamed. The principle of a decentralized and regional organization has successfully proven itself over many years. Furthermore, the conversion will neither lead to the liquidation of the Company nor the formation of a new legal entity. The legal and financial identity of the Company will be preserved. No transfer of assets will take place. In addition, the change of the legal form does not result in any financial or tax consequences. 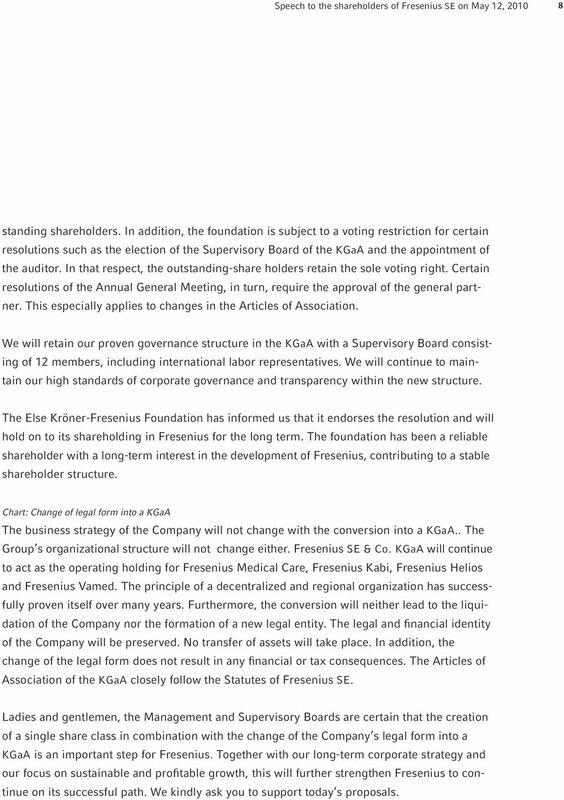 The Articles of Association of the KGaA closely follow the Statutes of Fresenius SE. 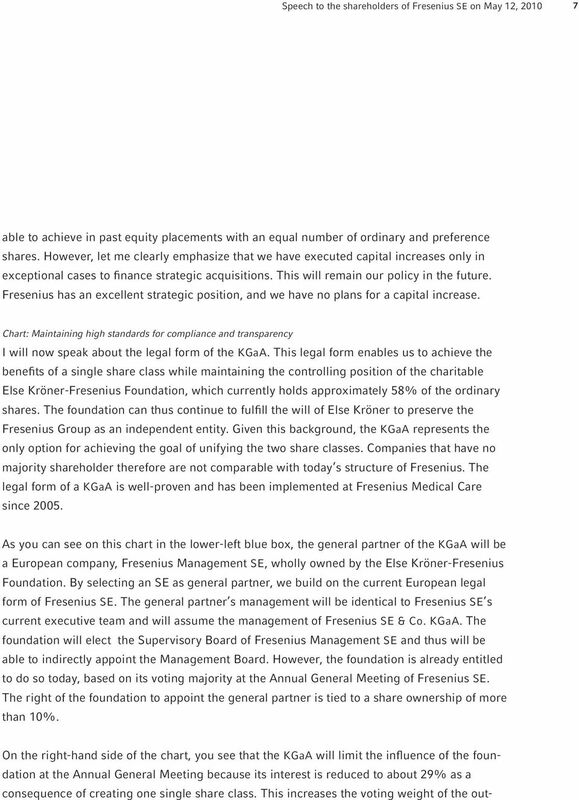 Ladies and gentlemen, the Management and Supervisory Boards are certain that the creation of a single share class in combination with the change of the Company s legal form into a KGaA is an important step for Fresenius. Together with our long-term corporate strategy and our focus on sustainable and profitable growth, this will further strengthen Fresenius to continue on its successful path. We kindly ask you to support today s proposals. 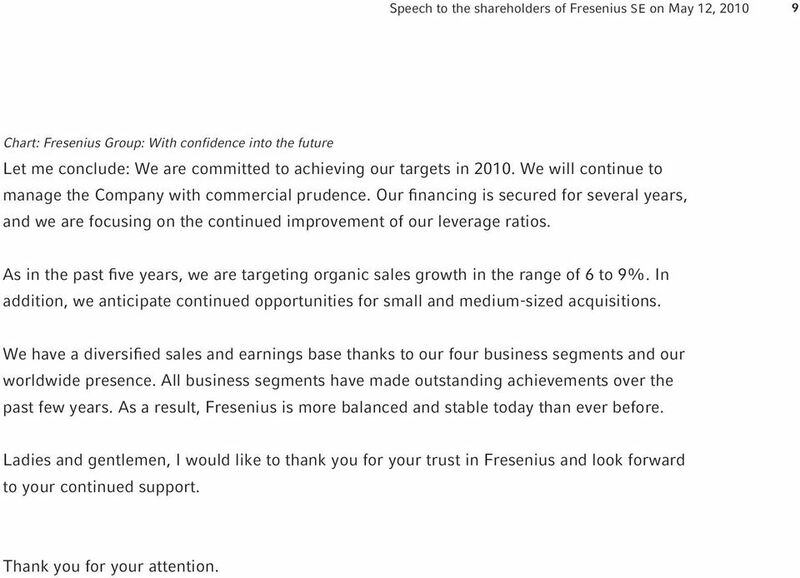 9 9 Chart: Fresenius Group: With confidence into the future Let me conclude: We are committed to achieving our targets in We will continue to manage the Company with commercial prudence. Our financing is secured for several years, and we are focusing on the continued improvement of our leverage ratios. As in the past five years, we are targeting organic sales growth in the range of 6 to 9%. In addition, we anticipate continued opportunities for small and medium-sized acquisitions. We have a diversified sales and earnings base thanks to our four business segments and our worldwide presence. All business segments have made outstanding achievements over the past few years. As a result, Fresenius is more balanced and stable today than ever before. Ladies and gentlemen, I would like to thank you for your trust in Fresenius and look forward to your continued support. Thank you for your attention. Check against delivery. Hans Dieter Pötsch Speech at the Annual Media Conference and Investor Conference on March 13, 2014. What are our operational and strategic plans for the years up to 2018? And what financial targets are they based on? Annual General Meeting of Gerresheimer AG on April 29, 2010. Speech by Dr. Axel Herberg Chief Executive Officer. - The spoken word applies. Convenience Translation the German version is the only legally binding version. Articles of Association. Linde Aktiengesellschaft. 187 Auditor s report. 188 Report of the Supervisory Board. 193 Boards 193 Management Board 194 Supervisory Board. 196 Glossary. Corporate Communications. Media Information 5 November 2013. - Check against delivery - Ladies and gentlemen, Good morning from my side as well. BROOKFIELD RENEWABLE ANNOUNCES 7% DISTRIBUTION INCREASE AND FOURTH QUARTER RESULTS Distribution increased from $1.66 to $1. FOR IMMEDIATE RELEASE O-I REPORTS FULL YEAR AND FOURTH QUARTER 2014 RESULTS O-I generates second highest free cash flow in the Company s history PERRYSBURG, Ohio (February 2, 2015) Owens-Illinois, Inc.